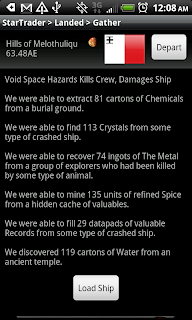 The newest release of Star Traders RPG has been released to the Android Market. Templars Rising - New Ships! These new Templar ships are not only great -- they also match a number of AI ships added to match (for Faction Warships and Smugglers.) They are the first part of a series of releases that will introduce the Templars --a secret Faction known to understand the Old Religion and pre-date even the Narvidian. The Templars are responsible for discovering the Quadrant and will be the Captain's route to building bases and settlements for his or her Faction. Not working for you? Too harsh? I'm not liking the torpedo looting. It seems to be too restrictive, but that may very well be my noobishness. We will see what the general consensus if, I'm more than willing to scale it back up somewhat. I've received a number of e-mails, however, complaining that the change made the start of the game a lot less fun (challenging) for pirates and military officers.